The overture opens in medias res, like a good classical epic. The tension between order and conflict is constantly renewed throughout the opera. And the plot itself is remarkable for its subversiveness: a father seeking to enforce his personal and political authority ends up chained to a rock in hell! (For a whirlwind overview of such wild ideas in eighteenth-century opera, see these posts.) Two brothers are going to resolve their feud with a wedding between their 50 daughters and 50 sons (!). 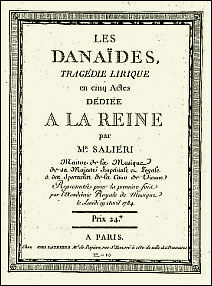 The elder brother, Danaüs (hence his daughters, les Danaïdes), is mistrustful and orders his daughters to slaughter their husbands on their wedding night (!!). All agree (!!!) except his oldest daughter, Hypermenèstre, who is deeply in love with her betrothed, Lyncée. She pleads with her father in vain to rescind his unnatural command. The second act closes with Hypermenèstre passionately expressing her own moral dilemma. I was thrilled by this on many levels. The wedding celebrations of Act III, with the undercurrent of fatal danger, have a tension that I can't help thinking Verdi would have relished. In Act IV, the surviving lovers meet, but are parted, and the curtain falls with their fate uncertain; only in Act V is the tyrannical Danaüs met with the political uprising he deserves, while the lovers are finally united. Not only is the plot effective, but I can't help thinking it could be very interestingly staged... although, of course, not without considerable expense due to the forces involved. In this recording, the opera is given a superb treatment by Les Talens Lyriques. There's a gorgeous tone to the strings throughout, and the ensemble does credit to the score's moments of lightness and celebration as well as to its driven, ominous energy. 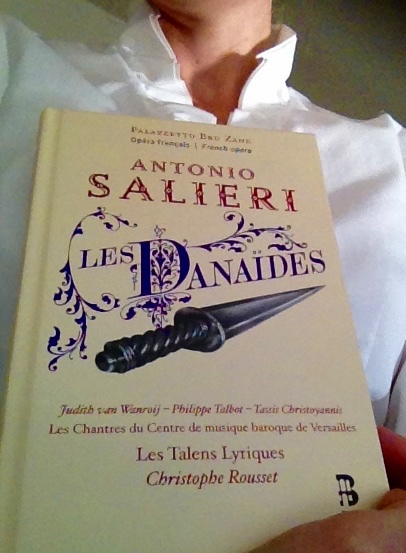 Throughout, Salieri uses contrast very effectively, alternating rejoicing choruses with tyrannical plotting or duets for Hypermenèstre and Lyncée. The chorus is specialized in baroque music, and it shows: their timing and their diction are alike impeccable. The accomplished soloists also deserve great credit for their attention to text and the emotional urgency with which they invest characters without a high degree of individuality. (I found the opera as a whole engaging and gripping, but the characters are types, if well-developed ones.) Thomas Dolié ably fills secondary roles necessary to the political dimensions of the drama. Judith van Wanroij and Philippe Talbot are the star-crossed lovers Hypermenèstre and Lyncée. Both sang with plangent tone and expressivity throughout. They have a particularly lovely duet, "L'amour à jamais nous enchaine." Their exclamation that nothing but death could break their bond of love could rightly be seen as ominous. Both singers do credit to their increasingly desperate situation. Tassis Christoyannis, whom I saw as Don Giovanni, sings impressively about his implacable hatred as the tyrant Danaüs. His rage is presented not as mere scenery-chewing, but the result of a deep, even paranoid suspicion. The opera's finale finds the chorus proclaiming the ceaseless punishment of his wickedness. Significantly, the tyrant himself is rendered voiceless.